Ask the experts for advice on when and how to change power steering fluid, and they’ll all agree: It starts with proven, high-quality fluid. Summit Racing delivers with a lineup of top-brand power steering fluid from names you trust—Red Line, Lucas Oil, Champion Brands, Driven Racing Oil, Royal Purple, ATP, and many others. 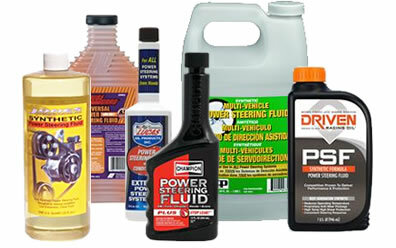 These fluids are formulated to improve steering feel and response, increase the life of your power steering components—even prevent power steering fluid leaks. Your power steering system maintenance starts with power steering fluid from Summit Racing. Get a $20 rebate when you spend at least $100 on Champion Racing Products! Go to www.championbrands.com/nmca.html for rebate details. Offer valid from 1/1/19 to 5/31/19. Must be postmarked before 6/1/19. Rebate will be sent out as a cash gift card. Offer valid in the USA only. Limit one rebate per household. Offer limited to end-users only.